In May I attended a very interesting seminar – ‘”I am a part of all who I have met”: Why Social Networks Mattered for Suffragette Militancy‘ – given at the Institute of Historical Research by Dr Gemma Edwards of Manchester University. In the course of this Gemma demonstrated how social network theory could be used to re-construct the networks that formed around individual suffragettes and how these networks could then be analysed to demonstrate the subject’s primary relationships and the influences likely to have been exerted on and by them. For an illuminating article by Gemma on the subject see here. For her paper at the IHR Gemma concentrated on two known suffragettes – Mary Blathwayt and Helen Watts – and related that she had a particular connection with the latter because it was thanks to her own father that papers relating to Helen Watts’ suffragette activities are now held in Nottinghamshire Archives. I little realised when I sat there reading through the Watts’ papers in the late 1990s that they had such a romantic past (or at least romantic to an historical detective). For, Gemma explained, in the 1980s her father, a Bristol history teacher, had set project work for his class and that one pupil had chosen as her subject the local women’s suffrage movement. She had then been sufficiently enterprising as to place an advertisement in a local paper asking for any new information. Rather amazingly a reply was received from a worker at Avonmouth Docks to say that a quantity of suffrage-related papers were held in a trunk that lay, apparently unclaimed, in a warehouse. The papers related to the suffrage activity of Nottingham-based Helen Kirkpatrick Watts. Gemma’s father was permitted to borrow and photocopy them, subsequently depositing the copies in the Nottinghamshire Archives. 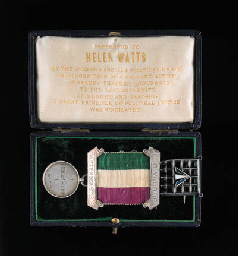 Knowing nothing of this rather bizarre provenance I duly wrote an entry on Helen Watts for The Women’s Suffrage Movement: a reference guide, recounting her suffragette life. I discovered, from an issue of Calling All Women, the newsletter published by the Suffragette Fellowship, that Helen had emigrated to Canada – to Vancouver – in 1965, the wording suggesting that this was a permanent move. I did like to anchor my subjects’ earthly existence with firm birth and death dates but in those pre-internet days I assumed that was as far as I could follow her – having no way then of discovering dates of death in Canada. However, after Gemma’s seminar I pondered on the mystery of how the trunk could have lain apparently abandoned at Avonmouth. Even though she had flown to Canada and organised for her belonging to have followed her by sea Helen Watts would surely have been on tenterhooks to ensure their safe arrival. Thus it seemed doubtful that the trunk could have failed to leave Avonmouth in 1965. In the days of my Reference Guide research all tracking of births, marriages and deaths had to be done by working through the hefty volumes held in the Family Record Office and its predecessors. Now, however, I can sit at my computer and at a click find dates in a second. So it was that, after Gemma’s talk, I entered details for Helen Watts and discovered that she had not died in Canada but in England – in Chilcompton, Somerset, aged 91 – on 18 August 1972 . Her permanent address at the time was 36 York Avenue, Hove. Her ’emigration’ had clearly not been permanent. However, one of her sisters, Ethelinda, a teacher, does seem to have taken up permanent residence in Canada, and in 1965 it was presumably Helen’s intention to live with her. Ethelinda Watts died in Vancouver three months after Helen – in November 1972. My suggestion is, therefore, that the trunk had actually completed its return journey from Canada when it lay forgotten at Avonmouth. Possibly by then Helen Watts was too infirm to keep track of her possessions – however treasured. It is not known what has happened to the trunk and the originals of the papers – perhaps Helen Watts’ wider family (Nevile Watts has numerous descendants) were eventually made aware of them. 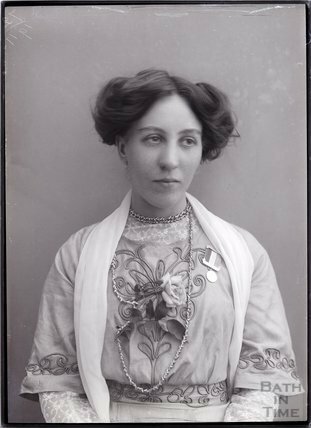 What must have been her most valuable suffragette mementoes – her hunger-strike medal and Holloway brooch – did resurface – for they were sold at auction in London in 1999. However it is more than likely that Helen Watts carried such an iconic item with her on her journey home rather than consigning it to the trunk. A little more investigation revealed something more of Helen Watts’ life after her brief and dramatic involvement with the Women’s Social and Political Union than was available when I wrote her Reference Guide biography. By 1911 she had left Nottingham and was living with her brother, Nevile, in Chilcompton in Somerset. He had rebelled in his own way against his family’s Anglican tradition (Helen and Nevile’s father was vicar of Lenton, on the outskirts of Nottingham), was now a classics teacher at Downside College, a renowned Roman Catholic school, and later converted to Roman Catholicism. You can read a short autobiographical article by Nevile Watts here. Nevile Watts married, fathered five sons, published several books and continued to live in Chilcompton. Helen probably remained in the area for some years – possibly joined by her other sister, Alice. Certainly in the 1950s the ‘Misses Watts’ are listed in the phone book as living at Crosslands, Wells Road, Chilcompton. This entry was posted on June 19, 2015, 12:16 pm and is filed under Suffrage Stories. You can follow any responses to this entry through RSS 2.0. You can leave a response, or trackback from your own site.